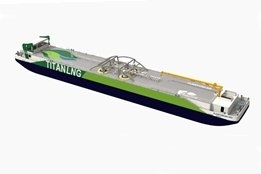 Fluxys and Titan LNG say they will jointly deliver a new liquefied natural gas (LNG) bunkering pontoon in the Port of Antwerp. The FlexFueler 002 pontoon will be operated by Titan LNG and is expected to be commissioned by mid-2020. It will serve Antwerp port and the wider region, including inland waterway vessels and small coasters. Titan LNG already operates FlexFueler001 from the Port of Amsterdam. “With FlexFueler001 and 002 providing back-up for each other, we can provide the operational certainty that ship owners require,” said Niels den Nijs, CEO of Titan LNG. "We are convinced that the Titan LNG FlexFuelers are the missing link to safe, economical, and speedy LNG delivery in the ARA region."